‘I was there and you didn’t see me’ is a series of research-based public interventions on photographic images curated by Samra Šabanović and Sheung Yiu. These interventions use images as starting points of inquiry about their indisputable impacts in philosophy, history, technology, science and visual culture. Through prolonged looking and peripheral vision, the duo revisits images (or the lack of them) and situates them in new discourses that extends beyond visual arts. This involves doing double-takes on images seriously and regularly, looking intensely at and around photographs to rediscover ‘what was there’ and ‘what was not seen’ at the first glance. Images are real. Images we choose to make (or not to make) incite real changes. Far from merely representations, Images are THE event itself. The interventions engage images to have a dialogue with the public audience, to speak about their desires and the secrets they hide. In the age when human spend more time making pictures than looking at them, the interventions serve as a reminder that images contain more stories about human society than they can visualise. The processes behind the pictorial plane - the way images are composed, produced, presented, circulated, exploited, archived and discarded - reveals a lot about the choices we made. These interventions are generally staged in public spaces. Transitional spaces such as bus stops and elevators encourage prolonged looking. Each intervention usually features one visual image, including but not limited to photography. Each photographic image is accompanied by a curatorial text, situating the images in new discourses. 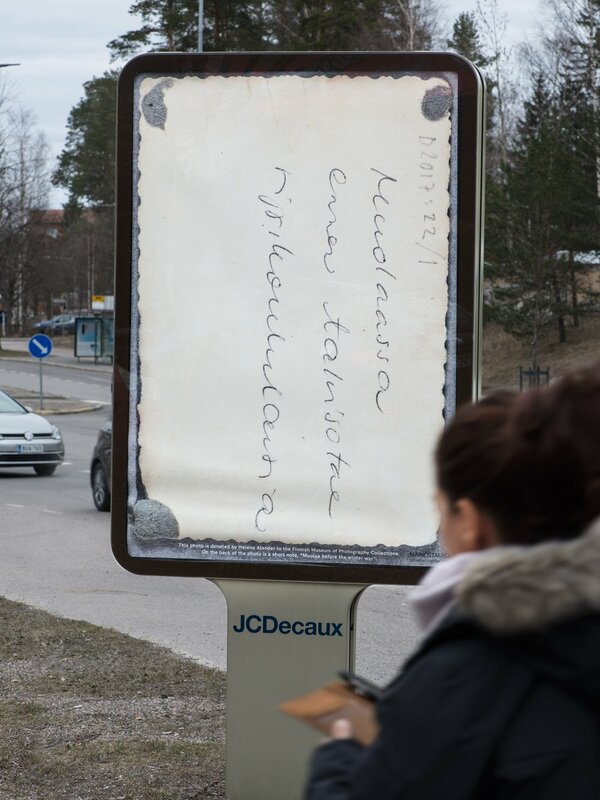 We collaborated with Street Art Vantaa and participated in the public art project Mainostauko during the Finnish election season. This billboard shows the back of a scanned photo from the @valokuvamuseo archive. The written text roughly translated to: "confirmation school children in muolaa before the winter war." As the staff explained to us, Muolaa was a city lost to Russia during the war. Special thanks to Sofia Lahti from the archive for her knowledge and expertise.